Starbucks Maple Pecan Latte is just one of the Starbucks seasonal recipes you will love. The peppermint mocha and pumpkin spice latte come to mind. But what happens when they stop making your favorite drink for the season? You make it at home of course! There are a few fall favorites from Starbucks including the maple pecan latte. 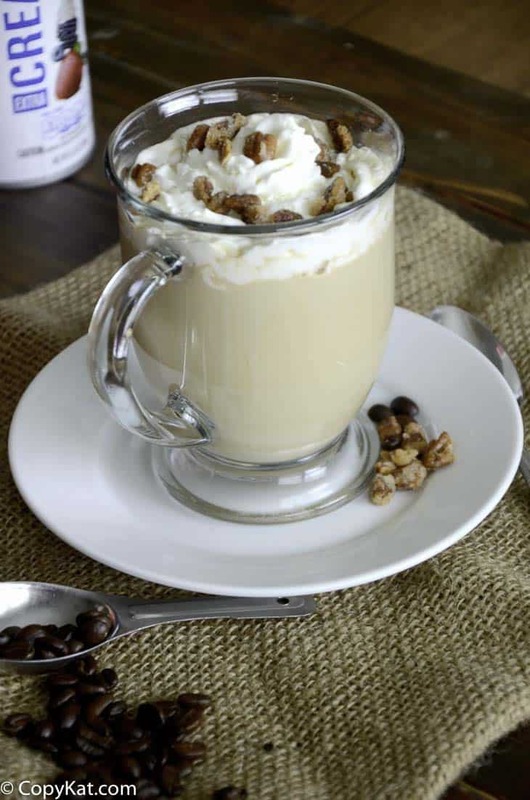 The maple pecan latte combines the sweetness of maple syrup with the crunch of toasted pecans. It is a fall staple on the Starbucks menu and a customer favorite. Being able to make it at home means you can enjoy it year-round and not only during the fall months. It also means you get to save some money by making it at home. The nice thing about Starbucks maple pecan latte is that it’s easy to recreate at home. You can use pure maple syrup to flavor your latte or maple flavored syrup such as this one from Torani. Either work great in this drink.For the pecan topping you can use plain pecans and chop them up for the topping. You can toast your pecans prior to adding them to your drink too. Or you can make or buy sugared pecans to make it extra special. 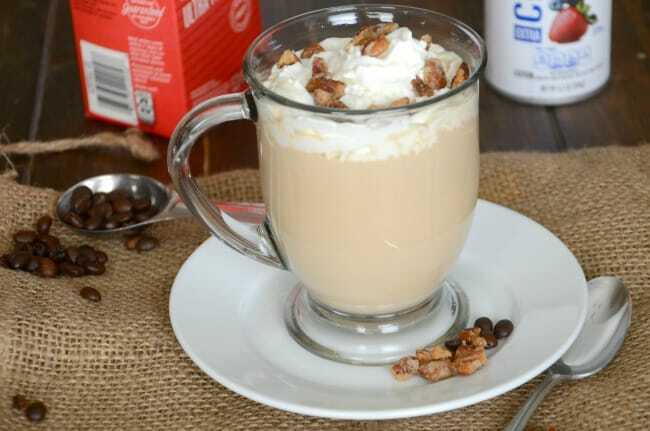 All of these options work great in this copycat maple pecan latte recipe. The base of this latte can be a shot of espresso or a cup of hot strong coffee. 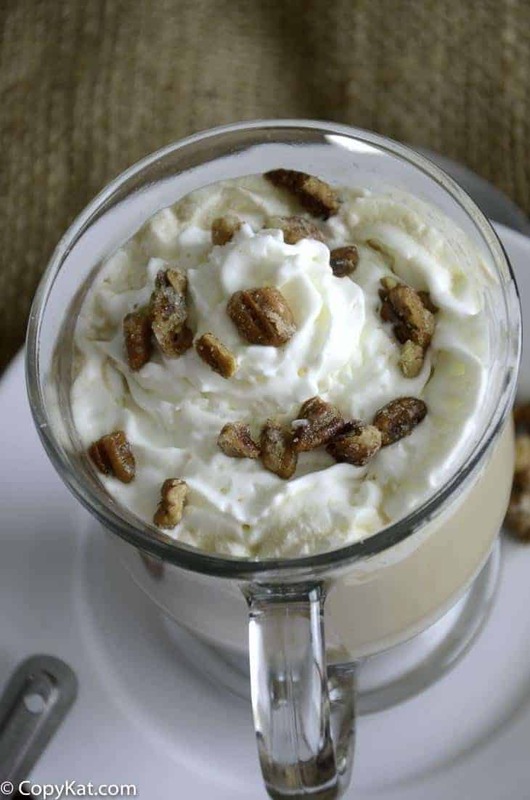 Frothed milk is then added and topped with sweet whipped cream and pecans. It is no wonder that this drink is so popular. So to make an espresso style coffee, you have a couple of options. You may want use an instant espresso like this one, or you may want to make an espresso style of coffee like many Italian do, with this Bialetti Moka pot. The Bialetti Moka pots are an inexpensive way to make a stronger cup of coffee on the stove top. Coffee is made when the water steams through the coffee, it has much less pressure than a traditional espresso maker, but it beats the drip method so many of us use at the house. To make aerate the milk and make it good an frothy you can simply put it in a jar with a lid and give it a good shake. In no time at all you will have milk nice and frothy. And my tip here is to use 2% milk because it will bubble up more than whole milk. Love Starbucks? Check out these recipes. Enjoy this fun Starbucks Latte at home. Add the syrup to the coffee and stir. Pour in the milk. Top with whipped cream and pecans. I love to make fancy coffee drinks when I watch movies at home. Yum Yum Yum. I don’t have a gadget that can steam the milk. How can I do it? I can’t afford that, so is there another way to do it without braking the bank for just a specific tool with only one purpose?? You can steam the milk by heating it up in a microwave until it is warmer. If you want to froth it up, place it in an old used glass jar with a lid and shake it up.